Some funny creature lost among monsters ? 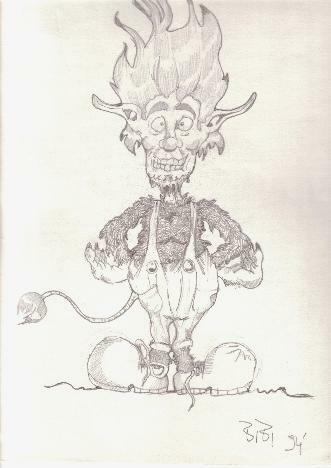 This is an example of the elflike creatures I happened to paint sometimes : looks happy with crazy hair and a goatee. Hmm surely reminds me of some loony but who could it be ? :) This picture was fully redone on the ST and can be found in the Back In France megademo. No copy, only imagination and a pencil. I used to sign this piccies under the nickname of "Bibi" as my parents and relatives used to call me when a kid. By the way you may also have noticed that it was done in 1994. Add comments : Not a great piece of art I agree but I like the style and above all the 'fur' part that looks quite good esp as it was done with a pencil totally used at random.